This page is to provide information to members on MAI Business and Planning. On behalf of artists and creatives in the Mangawhai area, Mangawhai Artists Incorporated has made a submission to Northern Regional Council about the Long Term Plan in relation to art and creativity in the region. "Mangawhai Artists Inc strongly disagrees with the proposal to stop funding to Creative Northland. The funding provided for Creative Northland is modest and has been used very effectively to support art and creative activities. Art, and creative activities and facilities, are a vital part of a healthy and thriving community and contribute to the local economy. Rather than ending funding we wish to see it increased and as a minimum, have parity with any regional rates funding spent on sport. While national funding is available as well, it is important for the regional council to consider and support creativity in Northland. In supporting spend on maritime and transport activities, Mangawhai Artist Inc asks that NRC include activities to prevent an oil spill from RMS Niagara. The Mangawhai Artists Gallery held an exhibition 'Gold and Oil. The legacy and Threat of the Niagara'. The exhibition had over 1000 visitors and most were shocked to learn about the Niagara and the oil it still holds. Many asked what regional and national government was doing to prevent a disaster. For more information see www.mangawhaiartists.co.nz/gold-and-oil." ​Your Committee has continued to explore options to deliver on the exciting vision which emerged from consultation with members. The desire is for a bigger fit-for-purpose space for Mangawhai Artists Inc with more gallery area, year-round space for learning opportunities and projects as well as improved facilities. This is a summary of the two stage development strategy – the full report will follow shortly right here on our website. In a consensus decision the committee as set the strategy with solutions for Mangawhai as it grows, continues to attract artists and visitors and develops as a thriving creative community. This builds on what we have now which is successful, well known and loved. We hope to gain approval to increase the size and improve facilities within the current Gallery and commence this before the end of March 2018. The committee is seeking a lease with the Library Hall Committee (our landlord) which will enable the current Gallery to continue as an arts space when MAI has completed the second stage of a Mangawhai Community Arts Centre during 2020 - 2021. A two-staged approach allows us a period of overlap. The current Gallery need not be disrupted while plans for a Community Arts Centre are finalised, money is raised and a new hub is built. The concept for the proposed Mangawhai Community Art Centre is a discrete lease of an identified site within the Mangawhai Community Park between the Museum and the Historic/Pioneer village. This is a long-term plan for a purpose-built space fully completed and a thriving Centre 2022 – 2052. Costs will be in the vicinity of $350,000 and funding applications will be made for a substantial amount of this as well as fund-raising. Much more work is required on the short-term and so we can make it all happen! Please talk to committee members to help progress the strategy! 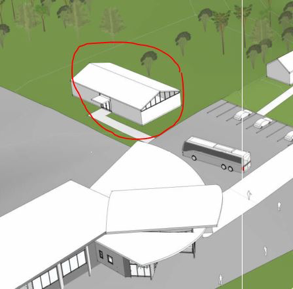 ​2) the positioning of the future Community Arts Centre near the Mangawhai Museum.